Harry Kane became Tottenham's record scorer in the English Premier League by grabbing a second-half double in a 4-0 win over Everton on Saturday. The England striker moved onto 98 goals, surpassing the previous mark of 97 set by Teddy Sheringham, thanks to two tap-ins at Wembley Stadium. Son Heung-min put Tottenham ahead in the 26th minute, courtesy of another close-range strike, and produced possibly the highlight of the game with his spin and driving run to set up Kane's first goal. Christian Eriksen wrapped up victory in the 81st with a fourth goal, smashed home from the edge of the area, after good work by Son and Dele Alli. Fifth-place Spurs moved level on points with Liverpool, whose game in hand is against Manchester City at Anfield. Everton, which had a headed goal by Wayne Rooney disallowed when it was 0-0, hasn't won any of its last five games in the league. The team continues to struggle in attack, with the addition of Turkey striker Cenk Tosun — handed his debut following his arrival from Besiktas last week — failing to have an effect. 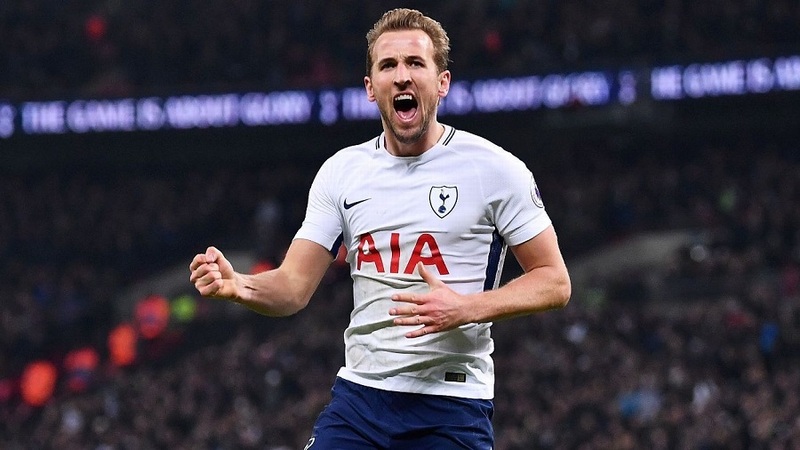 Tottenham has no such problems with Kane. The striker is the league top scorer with 20, three more than nearest rival Mohamed Salah. There was a hint of luck about his second goal, Tottenham's third, with his finish from Eric Dier's cross coming off his studs and flicking up over goalkeeper Jordan Pickford and into the corner.